Horatio Nelson’s trip to Killiney Beach | Come Here To Me! Pólo is a longstanding Come Here To Me! supporter, and contributor of many fine comments. We’ve met on a few occasions now, such as at the recent CHTM! booklaunch. 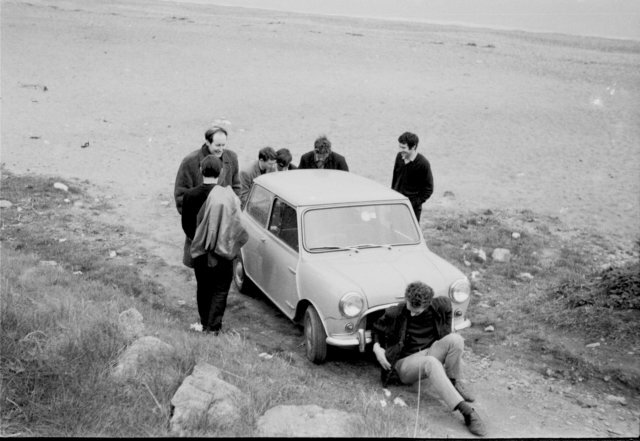 Carrying a camera around in 1960s Dublin, Pól captured some real gems and moments in Dublin’s history. 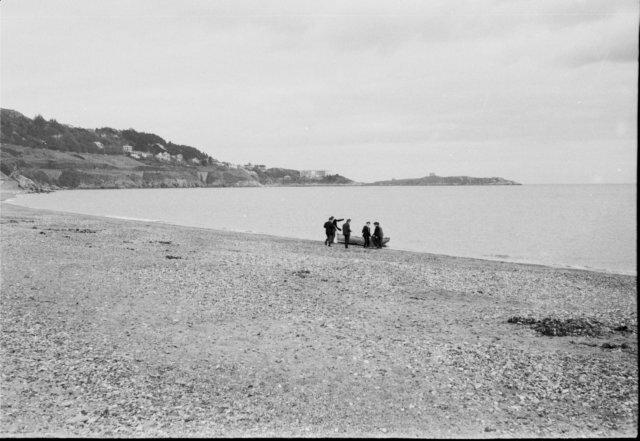 He’s allowed me to reproduce these brilliant photos on the blog, of a time he saw the head of Horatio Nelson on Killiney Beach! The words are his, as are the snaps. 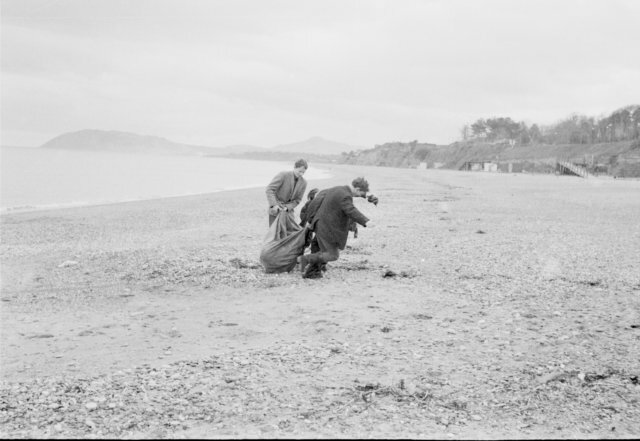 One day in late March, 1966, I was walking along the station road in Killiney when my eye was caught by something unusual happening near the waterline in front of Homan’s. One of Homan’s long rowing boats was partly drawn up on the beach and seemed to be flanked by balaclavad figures presenting oars. It was too far away to be sure of what was going on. I had my camera across my shoulder and I set out for Homan’s. When I got there the action, whatever it had been, was clearly over and there were just a few ordinary looking people hanging around. I was convinced, however, that something had been going on so I started photographing what remained. The boat was still there but there were no balaclavas and no oars. There was an odd looking sack which clearly contained something very heavy. I thought of a body but figured it wouldn’t fit. It was heavy enough, though, to leave a deep trail in the sand. 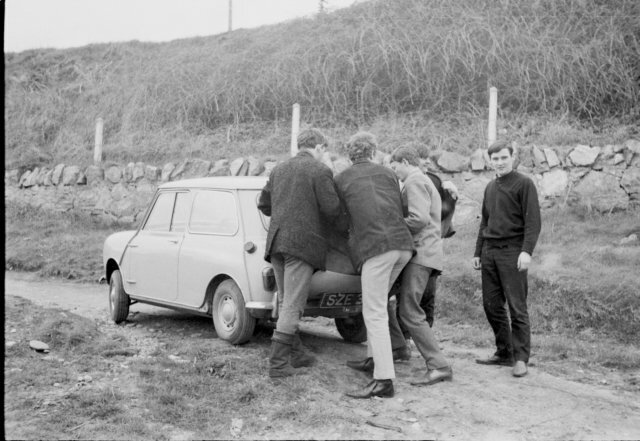 The guys eventually got it as far as their car, an Austin Mini parked on the outcrop which can be accessed from the road. I couldn’t see the registration number and went round the front of the car for a better view. Quick as a flash, one of the people was sitting on the ground obscuring the registration plate. At this stage, I figured it might not be in my interest to hang around much longer and I scarpered. I thought no more about it, writing it off as one of the mysteries of life. Then, unexpectedly, the plot was revealed. 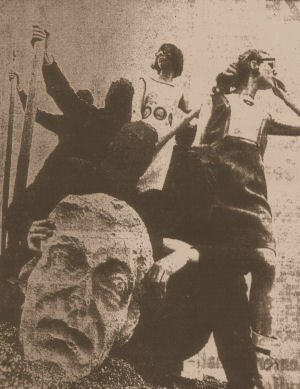 The Evening Press, of 2 April 1966, carried a photo, on page 4, which explained everything. The people I had seen on the beach had got a hold of Nelson’s head, which was indeed missing at that time. They had taken a photo at the waterline with the head in the foreground. I don’t know whether the photo had been commissioned or whether they subsequently managed to flog it to an agency. But, two young ladies had been photographically patched into the background in the photo studio, and the result ended up as a fashion shot in the Evening Press! The Evening Press image from the beach, which Póló tracked down! This great story was first told over here, on Póló’s own site. A quick search on Come Here To Me! will reveal our back catalogue of articles on Nelson’s Pillar. My thanks to Póló for helping to add another! Horatio Nelson’s trip to Killiney Beach was a very interesting story.I liked the story very much. Excellent post to start the new year. Thanks Polo for sharing this.